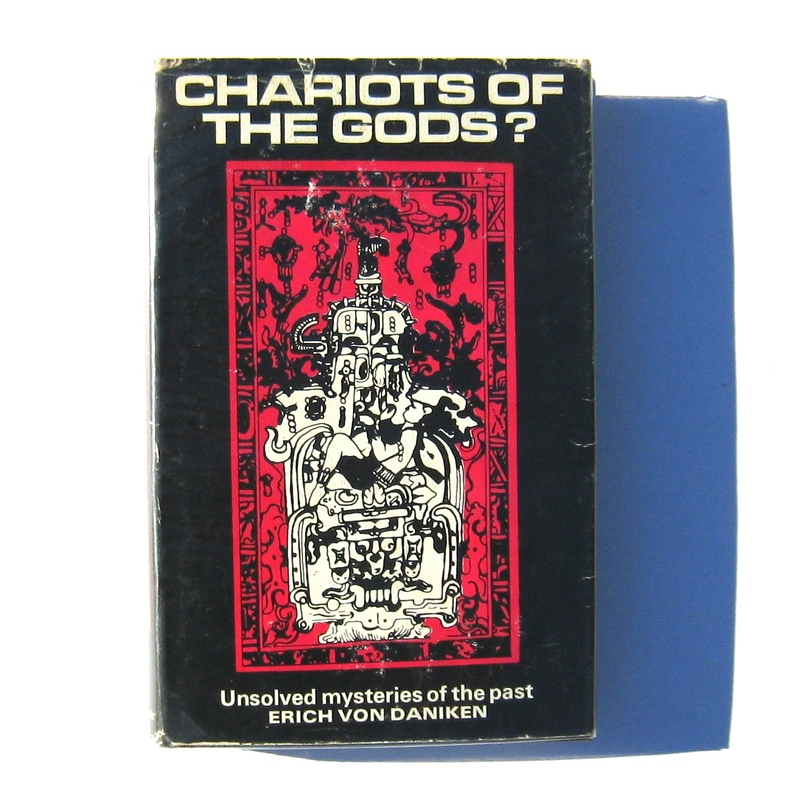 It is not easy to appreciate the interest – the fervour even – generated by Erich von Däniken’s book Chariots of the Gods? when it was published in 1969 (the year after the original German publication). Without doubt the excitement was fuelled by the Apollo 11 moon landing in July of that year. Anything seemed possible: Men on the moon! Men in space! Men from space! We were a less travelled, less informed, more credulous society back then and our imaginations – sparked by flickering black and white TV images of astronauts Armstrong and Aldrin – were fertile ground for stories of interstellar visitors and alien presences on earth. So it came to pass that a poorly researched, unscientific collection of tall tales and doctored images by a self-educated Swiss convicted of fraud became an international best-seller. It’s such a delicious concept. Emissaries from distant stars visit earth to kick-start primitive humanity’s scramble towards civilization. In von Däniken’s universe everything from Stonehenge to Macchu-Picchu points towards ‘contact’ with god-beings from space. Powerful stuff which, no matter how one tries, cannot be discarded as crackpot theories. A brief Vinyl Connection textual analysis demonstrates that we are not, perhaps, in the zone of hard science. The count is the number of times each word (or derivative) appears in the first four pages of Chariots of the Gods? That’s a stretch-your-credulity rating of 20, suggesting that you have to work pretty damn hard to avoid a one-way trip to Planet Crackpot. 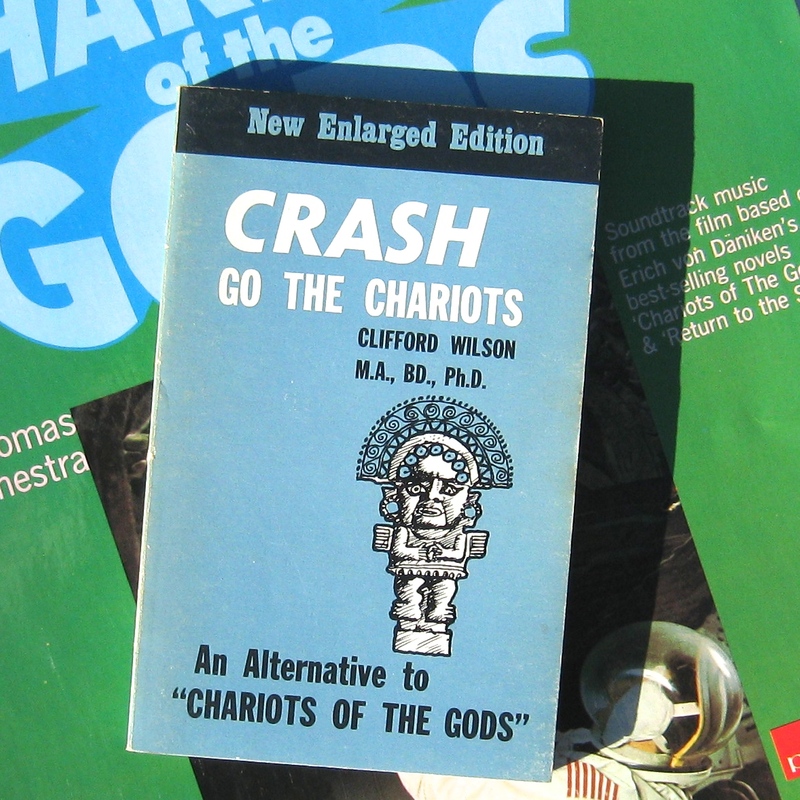 …for the continuing popularity of books like Chariots of the Gods? in high school and college logic courses, as object lessons in sloppy thinking. I know of no recent books so riddled with logical and factual errors as the works of von Däniken. But Herr von Däniken is not easily dissuaded. Even into the 21st century the author and former Hotel Manager was simply claiming that science remains unready for his ideas. In 2003 he designed a ‘mysteries of the world’ theme park in his home country. It’s a matter of belief. Despite the fanciful nature of his claims the popular imagination remained stimulated and funding was secured for a film. Astonishingly, this film was nominated for an Academy Award in 1971, not in the Science Fiction category, but in Documentaries. Of more relevance to us here at Vinyl Connection, however, is the fact that the film had a soundtrack. One theory that is testable is that the soundtrack of the film, composed by Peter Thomas, is great fun. Although open to the criticism of being a disjointed patchwork, if you think of it as a carousel of styles, sounds and ideas then it is a wonderfully entertaining ride. Reprise of the exotic theme. Frenetic 60s big band freakout. Celestial radio static over bass riff. Baroque theme: brass and harpsichord with an added shiver of sinister. Variation on the Main Theme: imagine Hitchcock in a Mayan Temple. Rising string sequence that chills the Mediterranean sunshine. Of course, a much simpler way to dip into the album would be to listen to it. 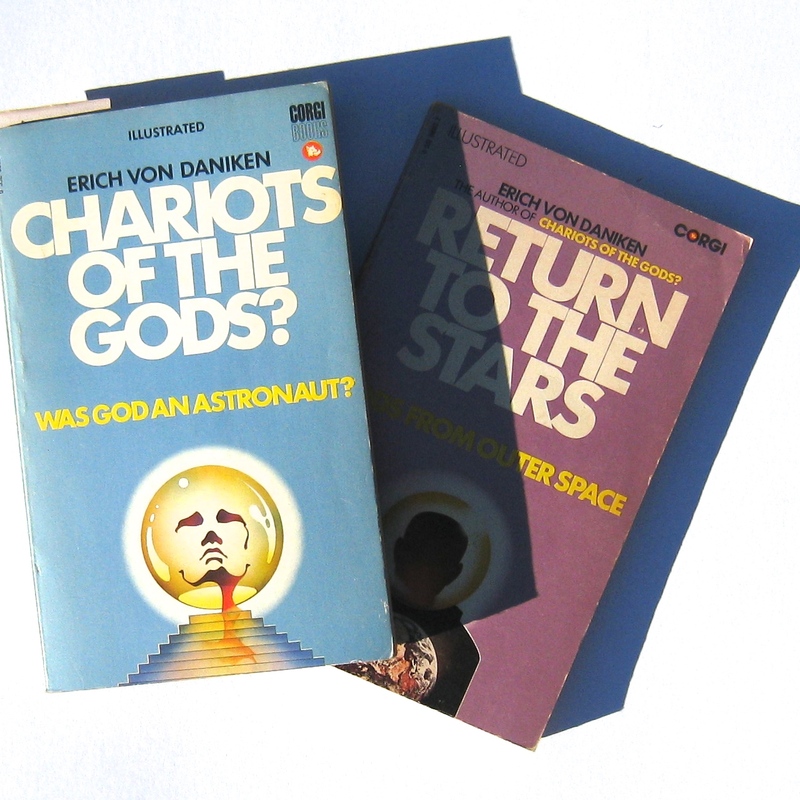 Herr von Däniken’s second book, Gods from Outer Space, was written in prison where he was serving time for fraud. If you want more of the man himself, he has a web site. As I screeched at the back masking Doors dude, “I BELIEVE”! Heh heh, not really, I just wanted an excuse to say it again. Your description of the soundtrack sent me into paroxysms of leaky-eyed laughter, almost on the same level as John Mayall’s holiday journal. So glad you enjoyed it Marie. Surely another fine example of truth being stranger than fiction! Suitable music for an author who, reportedly, admitted forging evidence so that people would be more likely believe in the book. Indeed. I find it great fun and far more convincing than the book! “Brass Fanfare with Rattlesnake!” The forthcoming EP from the band I’m about to form (if only). Great, and spot-on description of the first side! How often do you spin this astrological anomaly? I’d been seeking this soundtrack for a while and happened on it at the gloriously named Kongwak Market (in Kongwak, don’t you know; every Sunday) during our summer hols. But, somewhat to my own surprise, I’ve played it a few times. It makes me smile. Glad it had the same effect on you! This book opened my mind to all the different alternatives to widely accepted historical and religious belief. Erich von Daniken has asked many questions and made many speculations that challenge general perceptions about our origins and civilizational advancements.His honesty in stating that they are no more than speculations meant to spark inquiry and discussion must be appreciated. Nowhere does he claim them to be hard facts. A must read for everyone especially those into history and religion. Thank you for visiting Vinyl Connection and taking the time to reply. While inviting divergent opinions, I must respectfully disagree with you on several points. Firstly, it is not ‘honest’ to disguise doctored and falsified material even if you do call it ‘speculation’. Secondly, von Daniken ignores decades of legitimate scientific enquiry and gives his fantasies equal weight. Thirdly the logic is profoundly flawed. Perhaps a ‘must read’ only for those interested in fantasy and hoaxes! Still, delighted that you were engaged. Man, this brings back a flood of memories. Thanks to the film, my pre-adolescent friends and I knew the aliens were out there and had visited Earth just as firmly as we knew Japanese cars were junk. We had no doubt — the evidence was right there in the film!! I imagine the ominous rattlesnake served to reinforce our acceptance of the obvious truths being scienced there on the screen. That said, this post had me doubting. 1970 was too early; I would have been too young. Damn it, VC. I wasn’t ready for yet another stolen memory… oh, but thank goodness for Wikipedia where I found the following: “The film was edited and dubbed into English in a 1973 American TV documentary, In Search of Ancient Astronauts, narrated by Rod Serling.” Memory saved!! Rod Serling, eh? How impressive (and somehow fitting). I’m relieved your teenage memories didn’t cop another beating, and that you can still enjoy the idea of interstellar spacemen visiting Earth. In fact, visiting parts of the world you visited as a card-carrying grown-up, I believe. Though investigating aliens may have been beyond your remit.